A rail is a steel bar extending horizontally between supports which is used as a track for rail road, cars or other vehicles. Both the upper and lower tables were identical and they were introduced with the hope of double doubling the life of rails. 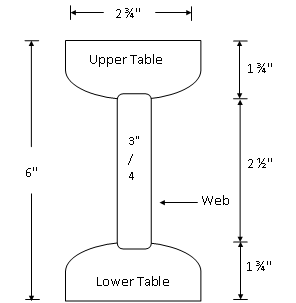 When the upper table is worn out then the rails can be placed upside down reversed on the chair and so the lower table can be brought into use. But this idea soon turned out to b wrong because due to continuous contract of lower table with the chair made the surface of lower table rough and hence the smooth running of the train was impossible. Therefore, this type of rail is practically out of use. Nowadays, these rails vary in lengths from 20 – 24. 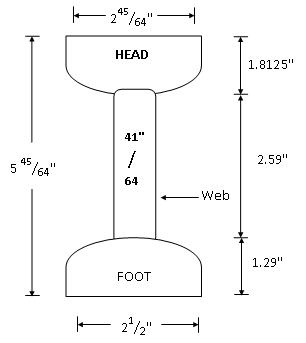 A 100 lb double headed rail is shown in the figure. These rails were made of steel. 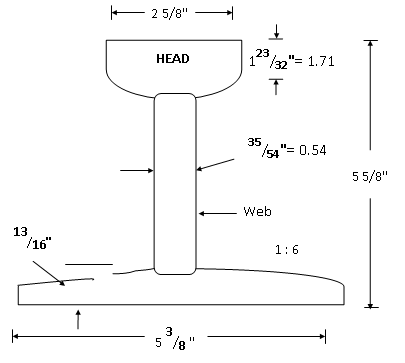 The head is of larger size than foot and the foot is designed only to hold up properly the wooden keys with which rails are secured. Thus, the foot is designed only to furnish necessary strength and stiffness to rails. 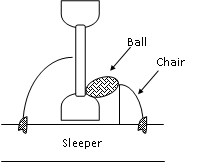 Two cast iron chairs are required per each sleeper when these rails are adopted. Their weight ranges from 85lb to 95lb and their length is up to 60 ft. The foot is spread out to form a base. This form of rail has become so much popular that about 90% of railway tracks in the world are laid with this form of rails. They do not need any chair and can be directly spiked or keyed to the sleepers. Thus they are economical. They are much stiffer both vertically and laterally. The lateral stiffness is important for curves. They are less liable to develop kinks and maintain a more regular top surface than bull headed rails. They are cheaper than bull headed rails. The loads from wheels of trains are distributed over large number of sleepers and hence larger area which results in greater track stability, longer life of rails and sleepers, reduced maintenance, costs, less rail failure and few interruptions to traffic. The separation or cutting of rail due to friction and abnormal heavy load is called wear. There are three types of wears of rail. 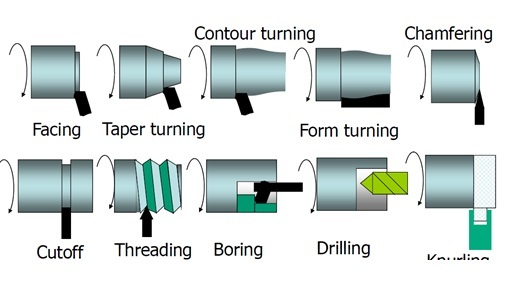 The following methods are adopted for reducing wear of rails.